ALARM.COM cameras allow you to keep an eye on activity at your property with professionally hosted video monitoring. Connected security cameras are an investment that you shouldn’t need to make again and again. Buy standalone connected cameras, however, and you may find yourself replacing them every few years for a model with better features. With Alarm.com-powered cameras, you won’t have this issue. Alarm.com regularly update our video monitoring solutions through the cloud, with upgrades and new features delivered digitally, free of charge. This gives your equipment a longer life, and better value. An Alarm.com-powered doorbell camera gives you a safe, smart way to see who’s at the door, no matter where you are. When a visitor rings the doorbell, you get an Alarm.com smartphone alert. Open your Alarm.com app and you’ll see a video feed of who’s there, with a microphone icon that you can press to start a voice conversation through the doorbell. • Unlock your door while talking/viewing in app! • Setup rules to automatically turn on porch lights! • Power: 8-36VAC, 10VA or 12VDC, 0.5 to 1.0A wired to in-home mechanical chime. 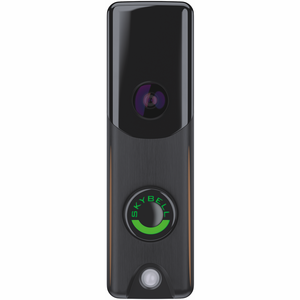 Digital doorbell chime compatibility requires SkyBell Digital Doorbell Adapter – not included. $220 or call us for possible discounts! $250 or call us for possible discounts! Alarm.com Indoor Cameras are a great way to keep an eye on loved ones, elderly family members, pets, children, use them as a baby monitor or verify who is in your home. Check out Alarm.com’s latest camera feature — The CITS-IDCAM-ADC-V622 has a Push To Call button located on the top of the camera for ringing app users to initiate a two-way audio conversation with video! ALARM.COM 180° view Wi-Fi 1080p Security Camera with Enhanced Zoom/Pan/Tilt, Push To Call Two-Way Audio and Bluetooth Speaker! • Push To Call Button on Top of Speaker! An intelligent, indoor wifi security camera with interactive features. Equipped with speakers, a microphone, and advanced video and audio features, the ADC-V622 is a wide-angle camera with a full 180 degree field of view. A 6MP image sensor and digital pan, tilt, and enhanced zoom capabilities give users true high definition video even when viewing zoomed-in live feeds. With a clean, modern design, the camera also features a call-out button. One tap initiates a Two-Way Audio call with other users on the account via the Alarm.com app. The ADC-V622 uses echo cancellation to block out unwanted noise for a seamless conversation experience. With Bluetooth-enabled speakers, customers can also use the camera to stream music from any mobile device. $150 or call us for possible discounts! 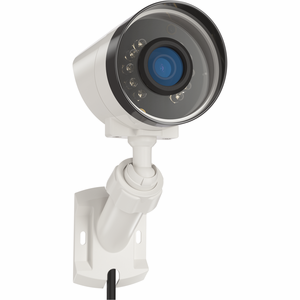 Alarm.com Outdoor Cameras are a great way to keep an eye on your property remotely. Check out the CITS-IDCAM-ADC-VC836 that has POE built-in and long range IR for night viewing. $200 or call us for possible discounts! All of these cameras require an Alarm.com paid subscription to function.